You might think that meteorites are all very similar, simply being rocks from space, but actually meteorites are quite varied. Their physical and chemical makeups tell a distinct story about their origin and history, and we can even identify some as originating from Mars or the Moon. Meteorites are divided into four broad categories: chondrites, achondrites, pallasites and iron meteorites. Chondrites are by far the most common type of meteorites. They were formed in the early solar system when dust grains began coalescing into small asteroids. Unlike other meteorites, they haven’t experienced enough heat to cause melting, and they haven’t been part of a large enough asteroid for differentiation to occur. Because of this, they provide the best source to understanding the conditions of the early universe. Achondrites are chondrites that have reached high enough temperatures to melt, or at least differentiate significantly. The process by which they formed is similar to the way basalt forms on Earth, so they can be difficult to distinguish from terrestrial rocks (unlike chondrites, which are quite distinct). Asteroids from Mars and the Moon are achondrites. Iron meteorites are pretty much what they sound like. While chondrites and achondrites are stony in nature, iron meteorites are dense iron-nickel. They originated from the cores of large asteroids or planetesimals that were shattered by a collision. Although they only make up about 5% of all meteorites, they are very distinctive, and are typically what people think of when they think of meteorites. Pallasites are perhaps the most unusual type of meteorites. They are noted from their mottled mixture of olivine crystals embedded in iron-nickel. You can see a slice of one in the image below. We aren’t entirely sure how they formed. One idea has been that, like iron meteorites, pallasites come from the destruction of large asteroids. But rather than coming from their interior, they came from the boundary region of their iron core and stony mantle. Thus the mixture of (stony) olivine and iron-nickel. Another idea is that they formed when large meteors collided with larger asteroids. Such an impact would create a mix of iron and stony material we see in pallasites. Recently a paper in Science (paywalled, but one of the authors has a free pdf here) has found evidence to support the collision theory. The team looked at the metallic portions of several pallasites using a superconducting quantum interference device (SQUID), capable of making very sensitive measurements of magnetic fields. What they found is that the metal in these pallasites were once highly magnetized. This is very interesting, because if pallasites had formed in the core/mantle boundary of a planetesimal, the iron wouldn’t have gotten cool enough to become magnetized before the planetesimal was shattered. If, however, pallasites were formed by an impact of a meteorite with a planetesimal, then the iron could cool while still in the presence of the planetesimal’s magnetic field. 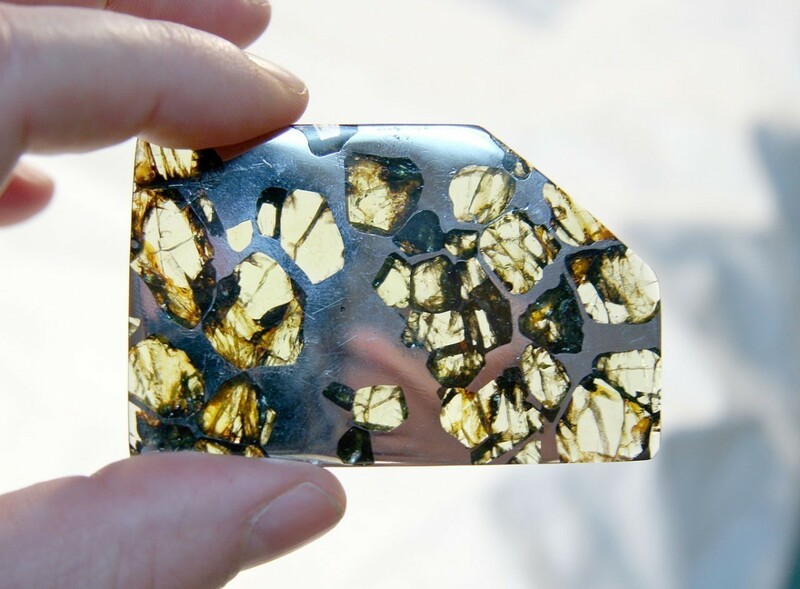 So the fact that the metallic regions of a pallasite were magnetized would seem to rule out the core/mantle idea. This would also imply that planetesimals in the early solar system likely had strong magnetic fields caused by a magnetic dynamo, similar to the way Earth still has a strong magnetic field. Modern asteroids don’t have strong magnetic fields, but there is some evidence that the asteroid Vesta once did. Paper: Tarduno JA, Cottrell RD, Nimmo F, et al. Evidence for a dynamo in the main group pallasite parent body. Science. 2012;338(6109):939-42.